Thanksgiving is prime time to share some new and old language concepts with your children. With so many words common to this holiday season, you can easily work on things like vowel sounds, letter and site word recognition with younger kids, all while you do hearty sentence structure and diagramming with older students. 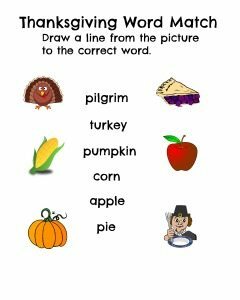 These Free Thanksgiving Language Arts Printables provide multiple lesson plans by themselves, or dozens when coupled with our Free Thanksgiving Lesson Plans. This All About Pie printable is perfect for the younger students. Not only do you have color recognition, you have some classification and of course fine motor skills involved. 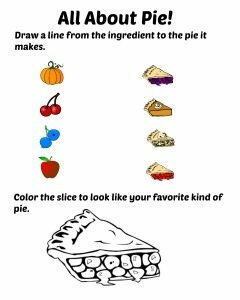 Grab the crayons for this one and encourage them to think outside the box when creating their favorite pie flavor. Review beginning consonant sounds with this Consonant Printable. This is great for the younger crowd who is just learning about sounding out words. This is also great for teaching kids about letters that make similar sounds, or letter combinations making different sounds. All kids love playing spy and cracking a mystery! 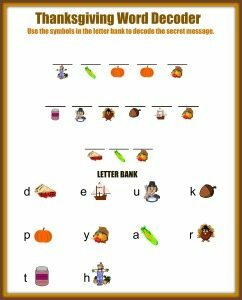 This Secret Message printable is perfect for your kids to learn how to use a simple code to decipher a secret message. For your student that has a better grasp on reading, this Thanksgiving Word Match is a great recognition sheet. Drawing a line from the image to the word describing it is simple, but effective way to teach your kids these as site words. Another great way to encourage reading and site word recognition is to use this great Thanksgiving Word Search. Not only will they be working on recognizing these words, they will be encouraged to search and find items that aren't easily presented. This is great for later when they need to be able to sound out compound words that are unfamiliar to them. 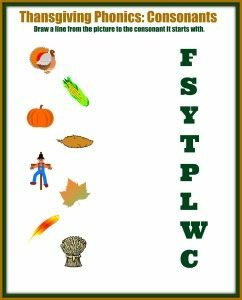 These simple language printables are excellent for young learners to use this Thanksgiving. Combine them with some of our Free Thanksgiving Lesson Plans for a complete holiday themed unit study.